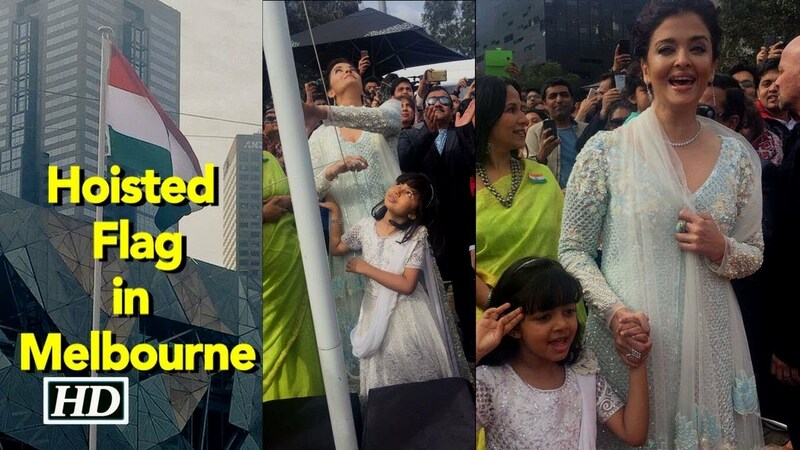 It was a moment of pride for Aishwarya Rai Bachchan and her little daughter Aaradhya Bachchan, who hoisted the Indian flag as a part of their celebration of 70th year of India’s Independence at Melbourne. She has become the first woman to hoist the Indian flag at Indian Film Festival of Melbourne (IFFM). And yet again Aishwarya stole the limelight with her appearance, Aaradhya also geared up to match her beautiful mother in terms of looks. The Mother-Daughter duo chose to wear Indian attires as they sang the National Anthem. Both looked elegant in their Indian attires. The little one looked like a Princess in an Indian lehenga, and on the stage, people just could not stop looking at her. Both mother daughter duo outfits are custom-made by leading Indian designer, Manish Malhotra. Malhotra's designs look absolutely ravishing on both Aishwarya and Aaradhya, and managed to convey the elegance, class and beauty. The former-Miss World donned a white and light blue embroidered suit. The detailed work and embellishments on the suit conveyed the richness of Indian handicrafts. Pairing the outfit with a delicate pearl necklace, white, dangling earrings and a few matching rings, was a good idea. And so was the chic-yet-messy bun. Aishwarya's outfit and makeup also brought out the colour of her eyes perfectly which made her even more attractive. Aaradhya's looks also was very good. Her white, embroidered lehenga, also custom-made by Manish Malhotra, made her look like the perfect Angel in white. And the silver bangles and the white headband, made her look like an angel. The actor gave a beautiful speech. It was a proud moment for her. 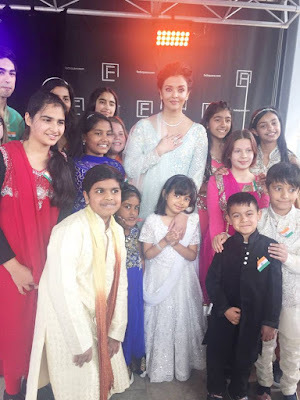 First she spoke in Hindi and then went on to translate her words into English for the non-Hindi speaking audience.She also mingled with the audience very nicely and even clicked some pics with her fans..All along her angel daughter was calm and composed Apart from Aishwarya, the event saw the attendance of filmmakers like Karan Johar, Dangal fame Nitesh Tiwari, Baahubali producer Shobu Yarlagadda, Shilpa Shetty, Sushant Singh Rajput, Rajkummar Rao and many others. As always Aishwarya Rai Bachchan has a penchant for making history. The ethnic outfits that Aishwarya and Aaradhya donned in Melbourne set them apart in a large crowd. No wonder they managed to steal the hearts of millions across the world.